Those who went to work at the start of the Iranian week on Saturday saw their money shed a quarter of its value by the time they left the office Wednesday. Signs of the currency chaos can be seen everywhere in Tehran, where travel agents offer vacation prices only in hard currency and diapers have disappeared from store shelves — something acknowledged by the supreme leader. 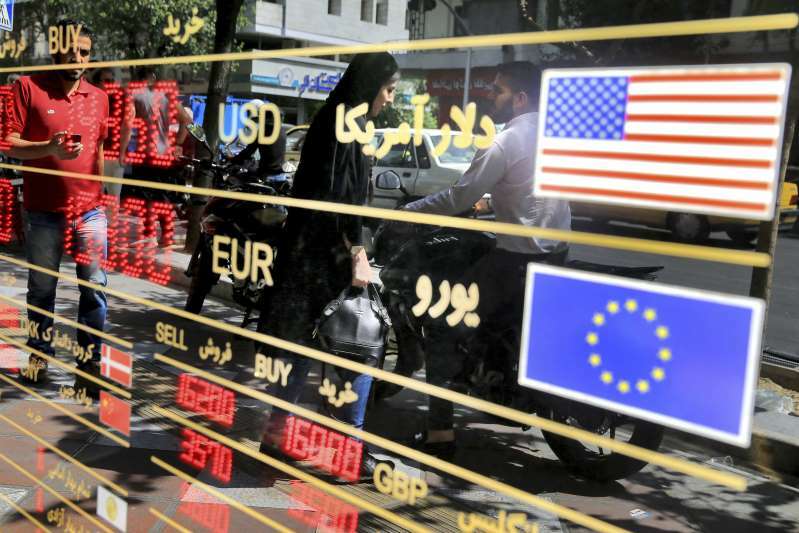 Many exchange shops in downtown Tehran simply turned off their electronic signs showing the current rate for the U.S. dollar, while some Iranians who wanted hard currency sought out informal money traders on street corners. Exchange shops that remained open offered 150,000 rials to the U.S. dollar. Iran's economy has faced troubled times in the past, whether from the shah overspending on military arms in the 1970s or the Western sanctions following the 1979 Islamic Revolution and U.S. Embassy takeover. Drastic fluctuations in oil prices have also taken a toll. Ayatollah Ali Khamenei, Iran's supreme leader, called the U.S. moves economic "sabotage" this past weekend, and specifically mentioned the diaper shortage. Some 70 percent of material for disposal diapers is imported. As the rial falls, it makes purchasing the material from abroad more expensive. The head of the government's budget and planning department told lawmakers Wednesday that authorities have allocated $13 billion for commodities and medicine, with another $6 billion to help the poor, according to parliament's website. Lawmakers dropped a plan for the distribution of subsidized goods directly to the people after budget head Mohammad Bagher Nobakht warned there would "be long queues in front of the shops, like money exchange houses, that can create an ugly scene in the city alleys and streets." Such lines could be seen Wednesday in front of money exchange shops near downtown Tehran's Ferdowsi Square. The shops required those purchasing foreign currency to show their airplane tickets for travel abroad. Those without tickets were turned away, with many seeking out informal moneychangers, who discreetly waved wads of U.S. currency to signal their presence. Those who were waiting cheerfully spoke to an American journalist visiting a city where weathered graffiti still proclaims "Down with the U.S.A."